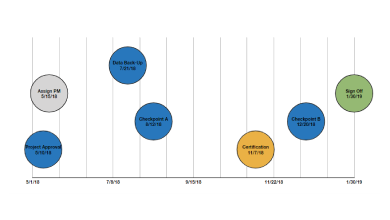 Timelines are a great way to visualize a series of events that happen over time, making it easy to understand and remember essential data. Professionals who need to create eye-catching timelines for important presentations can use their favorite office software, since almost all of the traditional productivity tools have functions that can produce such visuals one way or another. Since the steps to making a timeline can get quite complex, this page presents a series of detailed tutorials and resources to help you get started faster. Browse through the page to get a glimpse at the guides available for each tool or use the menu above to jump straight to the application you want to use for building your visual. PowerPoint is one of the most popular tools for presenting data to clients, managers, and any other non-technical audiences. It is familiar, intuitive, and widely spread in organizations of all types, allowing anyone with the Microsoft Office Suite installed to view and edit a project report or presentation. 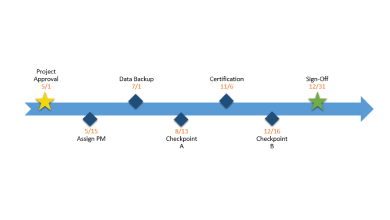 Click the icon or link below for a step-by-step guide on how to make a timeline in PowerPoint. Professionals who prefer to plan and track their projects in Excel can use the tool’s Scatter Chart function to turn their plans or schedules into a timeline. The process involves quite a few steps to make the graphic look tidy and presentable, and the result looks similar to the following image. Click the link below to see a detailed tutorial on how to build a timeline in Excel. Although commonly associated with writing and editing copy, Microsoft Word also provides some simple graphic tools that can help users create basic timelines and other similar visuals. 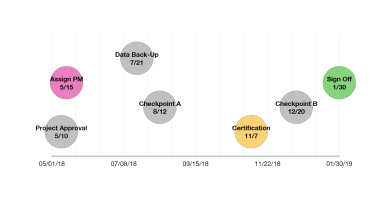 This step-by-step tutorial demonstrates how to make a timeline in Word using SmartArt Tools and provides a few customization tips to make the visual easier to follow. 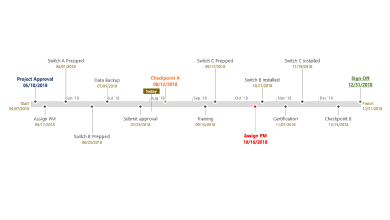 Professionals who manage complex plans in Microsoft Project can use the tool’s functions to create an overview timeline that shows only the key milestones of their project. 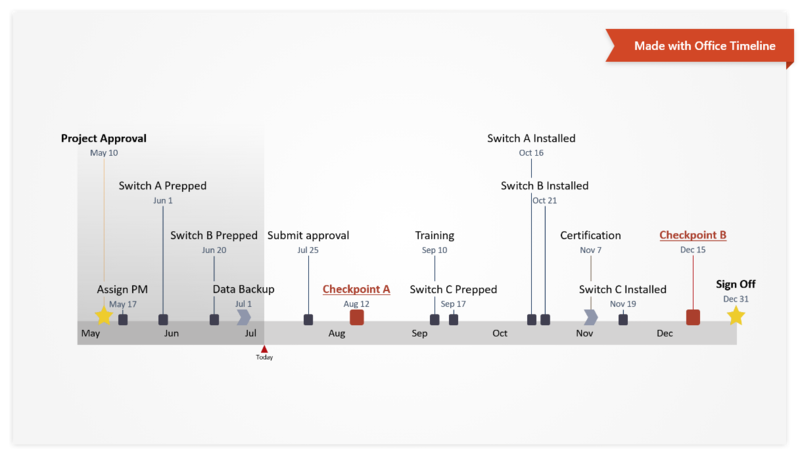 See a detailed tutorial that explains all the steps involved in building the timeline and preparing it for high-level presentations. 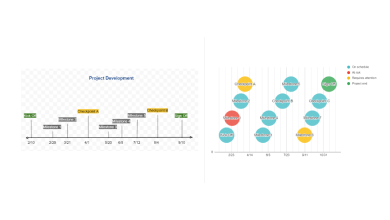 Professionals who need to collaborate on small to mid-sized projects can work with Google Docs to create a basic timeline online. The resulting graphic may need a bit of formatting to be easy to follow, but can be accessed and edited from any device with an internet connection. Click the link below to see the exact steps of the process. Apple's Numbers allows Mac users to create a basic timeline right in the spreadsheet app by tweaking a Bubble chart. 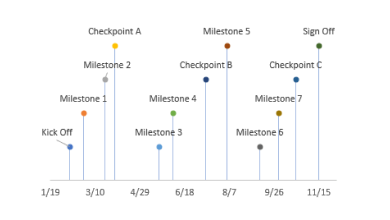 See a detailed Numbers timeline tutorial that explains all the steps involved in building and customizing the graphic to show key events or milestones more clearly. 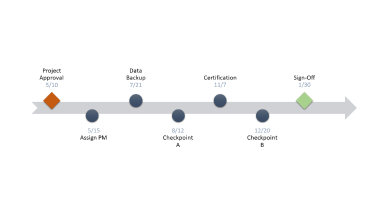 The guide also includes a downloadable timeline template for mac. While Keynote comes equipped with a variety of eye-catching charts and graphs, it doesn't currently have a built-in timeline feature. 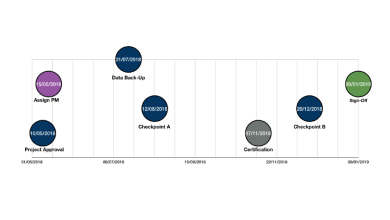 However, professionals who wish to illustrate a series of milestones or events in their presentations can still create a timeline in Keynote by formatting one of the pre-designed charts available. Click on the link below for a step-by-step guide. Primarily a word processor, Pages also comes with many of the graphic tools available in the other iWork applications. Therefore, Mac users who wish to include visual timelines in their documents can create them right inside Apple's word processor. This tutorial explains the steps to making a timeline in Pages and formatting it until it looks just right. For client and executive communications, professionals can use a PowerPoint timeline maker to build eye-catching visuals in less than 2 minutes. 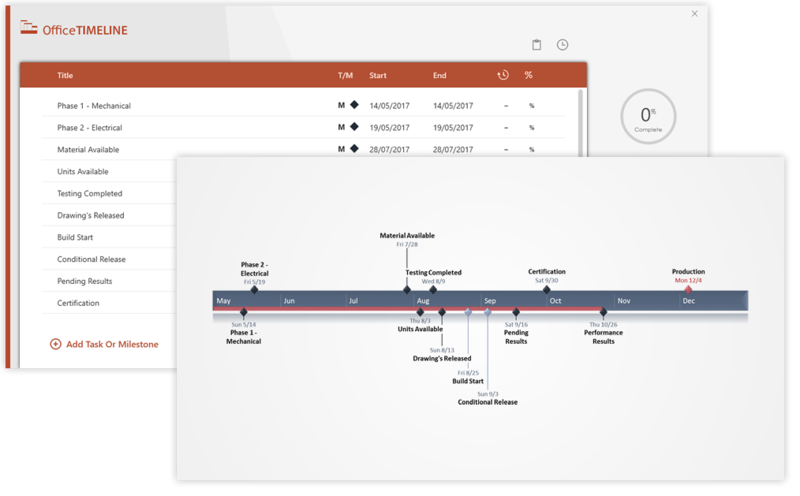 The Office Timeline add-in for PowerPoint integrates with popular productivity tools to instantly turn project data into timeline slides and update them on the fly.